Blink! Zip! Snap! 2018 is almost gone and what a wonderful year for mentor texts it was! In our standing annual tradition, our team shares our picks for the best mentor texts of the year. The right format is key to finding your way into a story. Inventiveness is woven into the fabric of two main character's parallel stories: A diamond in the earth and Tracey as he discovers how to make diamonds. Each main character is featured on their own page in a spread and described using the same words. She moves the story on with phrases like: Then one day… not yet…and then…This rock is… The page turns are brilliant. 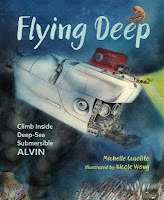 Lyrical, poetic, and scientific words are enhanced by bold illustrations, making this a moving, informative story. 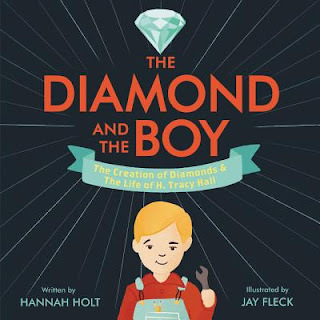 A piece of the author’s life is invested in this story as Tracy Hall (the boy) is actually Hannah’s grandfather. 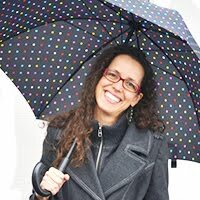 The story is one of resilience and creativity, and a must read for people of all ages. It's a gem! From the first cover illustration and the title, we are clued into Penelope Rex's problem....we haven't even opened the book yet, but we must see what happens. Yes, I mean to say that the page turns happen right from the cover! As excellent as that is, we get it from the title page, as well, with a promise from Penelope that you will never be eaten by a T. rex. You can bet that I want to turn the page again. Higgins captures the T. rex in an unexpected adorableness, worrying about her problem right from the beginning. Amped up with tension and relatable heart with capitals T-H, this story has the 1-2 punch. (She even hugs her character-laden backpack as we all do prior to the first day of school.) I want to be her friend, I am interested in her problem, and I already want her to be okay (even with the impending doom of kid-eating in her future.) And humor unites it all. This is the stuff that ultimate picture books are made of. Read and learn, friends, read and learn. 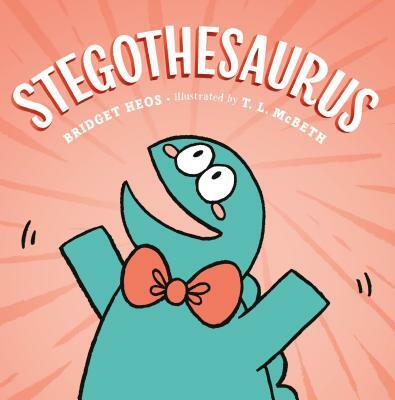 STEGOTHESAURUS is a great mentor text for humor, repetition, and unexpected twists. "Hi," said a stegosaurus. "Hi," said another stegosaurus. "Hello! Greetings! Salutations!" said the stegothesaurus. He was a little different. 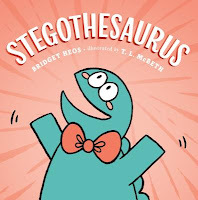 STEGOTHESAURUS's repetitive structure creates a great opportunity for humor and thwarted expectations. 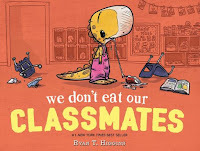 This is the kind of read aloud, that you don't mind re-reading--plus who doesn't love to learn new words? 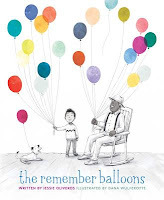 This poignant picture book uses balloons as an extended metaphor for memories slipping away from James’ aging grandfather. The text is written in simple prose. The illustrations show text and art working hand in hand making the metaphor more concrete for young readers. Most of the art is in black and white, while the “stories” in the memory balloons are in living color. The memories live on with James. The title alone invites readers to actively engage with the story. Written from the second person point of view makes the reader feel like they are piloting the deep-sea submersible, Alvin. From the very first sentence, Cusolito asks readers to imagine being the Alvin pilot in a space “barely big enough for three”. Tension rises by inviting kids to “investigate the site of deadly explosions” detailed overtime in one day’s dive. The illustrations depict the wonder and mystery of underwater life and exploration. Backmatter adds important details not included in the story, a glossary of scientific terms, and where to find more information for budding oceanographers. While I usually gravitate towards mentor texts that compliment my own work, I am aware that I need to stretch myself, as well. 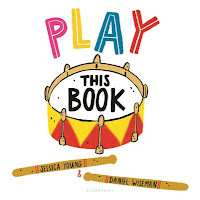 I have, therefore, chosen Play This Book by Jessica Young for it's brevity and interactive qualities. It is refreshing to see children (like my own grandsons) engrossed in simple, sweet text without quirky characters, hooks, or a complicated storyline. This is the type of book I started out striving to write. Maybe it's time to dig back in to my roots. And now, we prepare for a long winter's nap as we take our yearly blog break. We've prepared an incredible line up for the 5th-Annual ReFoReMo Picture Book Challenge. Stay tuned for announcements in the new year. 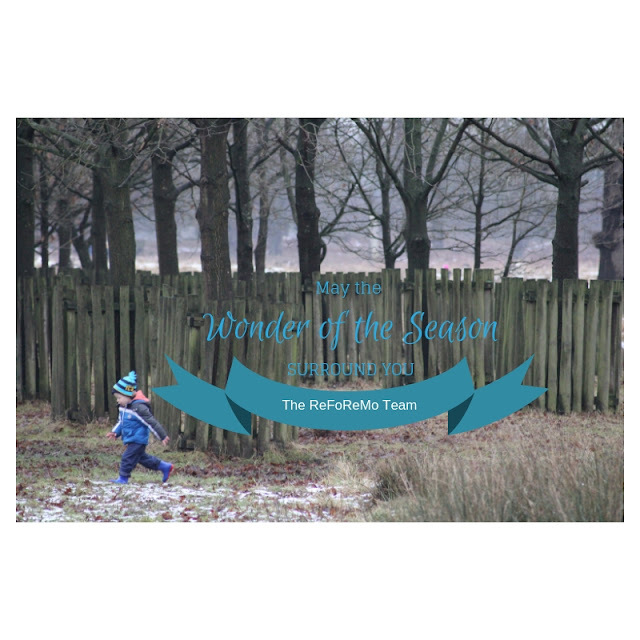 With New Year's Day falling on our regular Tuesday posting day, our blog posts will resume on January 8. Enjoy your families and find time to relax and take a well-deserved break along with us!